In only a couple weeks, Wii Sports Resort has sold an astonishing numbers of units. The first Wii Sports game was literally a system seller, and so the success of the sequel isn't really too surprising. The new, improved motion controls, which are the real draw of theWii in the first place, are accomplished with the aid of Wii Motion Plus, an addon for your Wiimote. The majority of the games are competitive, or single player only, as was the case with Wii Sports. But there are a few sports included that involve co-op gameplay. Wii lovers everywhere can now waggle and wiggle their way to victory with a friend, and not against them. 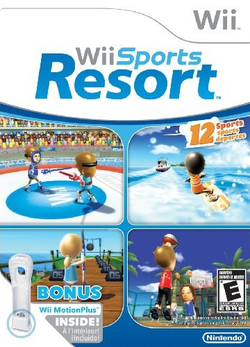 As a more traditional gamer, I was only mildly interested in Wii Sports Resort. My curiosity was more for the technical aspects of the Wii Motion Plus than the game itself. My family, on the other hand, loves Wii Sports, and it has probably had the most playtime out of any Wii title we own, especially when we have company over. When the game was released, I found an excellent deal and used a couple leftover gift cards to buy the game, plus one extra Wii Motion Plus attachment. My own feelings for the game were mildly favorable, but my wife and youngest son, especially, were quite impressed. Swordplay and the skydiving have been the most popular games so far for us. In general, the Wii Motion Plus works very, very well. True one for one relationships between your actions and those of your Mii are finally possible. Every twist, shake, or tilt is registered quite clearly. The pointing aspects of the controller haven't changed much, but in all other areas, it feels much improved. In my experience, the frisbee tossing game is the best example of the improvements. The exact same motions that would send the disc flying in real life translate perfectly into the video game. It's quite satisfying and a nice way to show the motion capabilities of the Wii off. It's unfortunate that it didn't work this way upon release, and to many Wii owners, buying new addons at $20 each will be distasteful, especially when there is the perception that "it should have done this already anyway". Enough about the controller: how about the games? In particular, what of the co-op games? Out of the twelve sports included in the game, only two of them feature cooperativegameplay as we define it here at Co-Optimus. Canoeing and Cycling allow players to work together to accomplish a common goal. While it's nice to see some co-op included, these two games are among the weakest when it comes togameplay and overall fun factor. 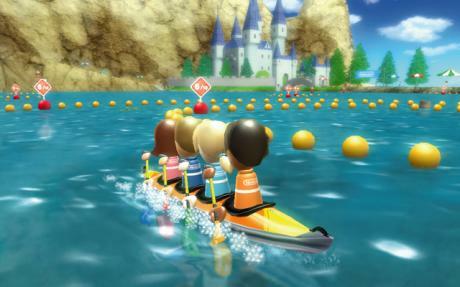 Canoeing allows for up to four Wii Motion Plus equipped players to participate. Each player has their own spot on the same canoe. Holding the Wiimote like an oar, you move the boat by swinging it in an arc, as if through the water. To go straight, you alternate between the left and right sides. To steer left or right, you paddle in each respective direction alone. The controls work fairly well, but the real problem is getting you and your partners to work together. After some goofing around and laughing at how poorly we were doing, we found that calling out which direction to row in worked very well. There's not too much depth here, really. The only goal is to beat a timer, which gets more difficult from round to round. There's little strategy to thegameplay at all, once you figure out a good technique to keep everyone together. Cycling is a bit more strategic, and feels more like an actual game than a tech demo. Only two players can join in at once, which limits the fun a bit. By using the Wiimote and nunchuck, along with the Wii Motion Plus, players pump their hands up and down, as if pushing the pedals. There is a heart meter representing your stamina; too much pumping and you will be forced to rest. 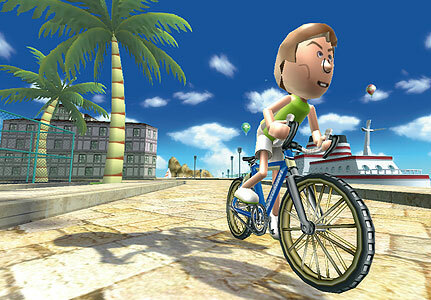 Since the two players share a bike, riding in tandem, one can "coast" while the other pedals. Steering is accomplished by leaning the remotes left or right, which felt quite natural. You race around an island, trying to pass others in an attempt to reach first place, from your starting location in the last position. The physics are quite realistic: you can rest in another players slipstream, coast quickly down hills, and it takes more motion to get up the hills, too. Multiple courses add to the replay factor. Of the two games, cycling is easily the best as far as co-op goes. Canoeing is really only fun in small doses. The lack of co-op in other games is unfortunate. Swordplay is a lot of fun, and one mode, where a single player fights their way across a bridge against dozens of otherMiis , would have been an absolute riot in co-op. I am sure a two player hack and slasher will be developed soon, and it should be tons of fun to play. As it is, co-op fans will have to settle forcanoeing and cycling. Honestly, though, the co-op is a small part of the appeal of Wii Sports Resort. The real reason to buy it is for the Wii Motion Plus, and between that and the real gems included in the game list, it's definitely worth checking out for anyone who owns a Wii.